Photo District News is a New York based publication, considered by many to be the industry’s leading publication. 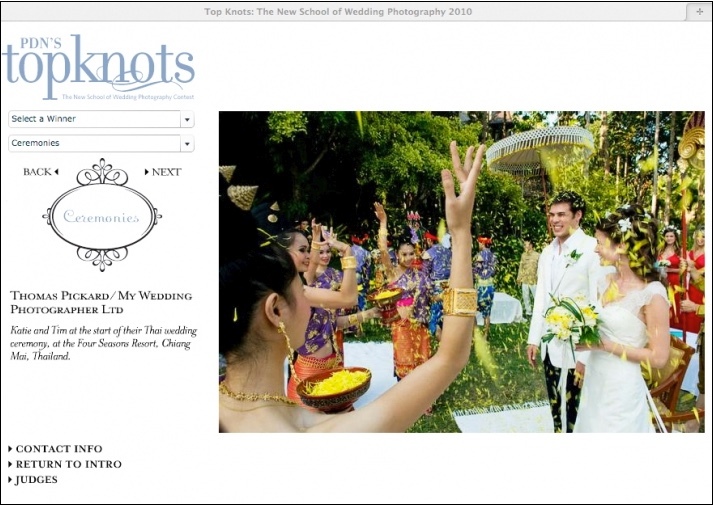 Each year PDN holds the PDN Top Knots Wedding Photography Contest. Given the calibre of wedding photography out there, competition is fierce. I entered my second PDN Top Knots wedding contest in 2010. I entered an image of Tim and Katie at the start of their Thai inspired wedding ceremony at Four Seasons Resort in Chiang Mai Thailand. About a month after entering it, I received an email advising me that I was a winner in the Ceremonies category!